Takeaway: The comfort and quality of your office chair can impact productivity at the office and affect worker health. Therefore, it is important to find the right ergonomic chair when purchasing furniture for workstations. The job of an office worker requires them to sit in an office chair for most of their working hours, in a position that could add stress to the spine and lower back region. (Learn more in "10 Important Ergonomic Aids for Office Workers".) As such, office workers are at a high risk for work-related musculoskeletal disorders. According to the CDC, The Bureau of Labor Statistics defines musculoskeletal disorders as conditions that affect the nerves, tendons, muscles and supporting structures; and are caused by awkward postures, overexertion and/or repetitive motions. (Learn more in "8 Key Areas of Ergonomics Employers Must Consider".) 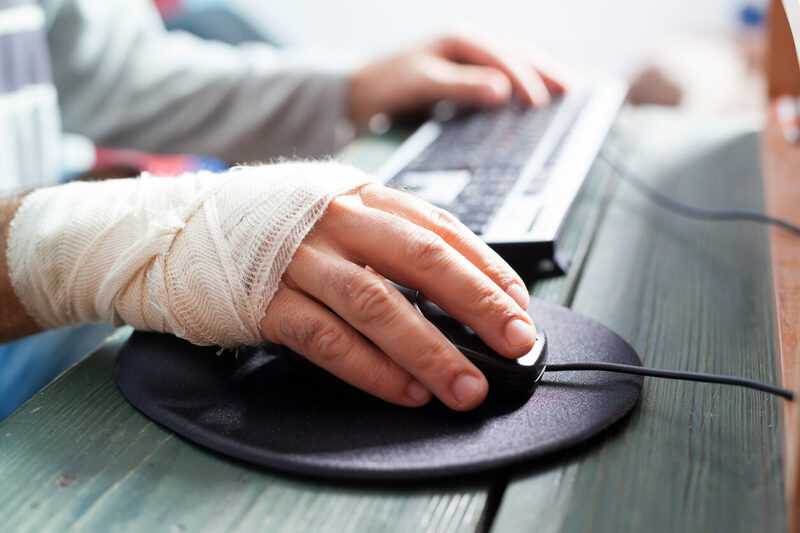 Additionally according to the Centers for Disease Control and Prevention, musculoskeletal disorders are the most self-reported work-related illnesses and account for 58 percent of all occupational injuries in the United States. Furthermore, while sitting is requires less effort than standing or walking, it places significant stress on the lower back region. Therefore, it is important to have an office chair that is ergonomic, which supports the lower back, as well as promotes good posture. What are the features of a good office chair? Adjustability – The seat height must be adjustable. Seat Height Range – The seat height must be adjustable to the height recommended for the office worker, usually within a range of 16-21 inches off the floor. The chair should have a pneumatic adjustment lever to allow the seat height to be adjusted easily. Additionally, the seat height should not compress the underside of the thighs. Seat Width and Depth – The seat should have enough space in both width and depth of the seat to comfortably support the office worker. Note that if you have workers who fall outside the 95% range you may have to purchase special seating to accommodate these outlier employees. Standard seat width generally ranges from 17 to 20 inches. Seat depth (from the back of the seat to the front of the seat, seat reference point) must be large enough so that an office worker can sit with his or her back placed against the backrest of the office chair while leaving only around 2 to 4 inches of space between the back of the knees and the seat of the office chair. Backrest – Chairs should have a backrest ranging from 12-19 inches wide. The backrest, if separate from the rest of the seat, must be able to support the natural curvature of the spine, with special attention being paid to correct support for the back's lumbar region. Therefore, it must be adjustable in height and angle in order to fit a variety of worker body types. However, if the backrest and the seat is one complete piece, the office chair must have the capability of being adjusted to both forward and backward angles, as well as having the capability of being locked in place in order to prevent the backrest from going too far back. Lumbar Support – A good ergonomic office chair must have a lumbar adjustment (both height and depth) so that any office worker can get the proper fit to support the inward curve of his or her lower back. Seat Material – The seat material must be thick enough to provide enough padding for the chair to be comfortable to sit on for extended periods of time. If the padding is too soft, it will not provide support for long periods of use. Additionally, the fabric covering the seat should be durable and breathable. Adjustable Armrests (optional) – Armrest must be adjustable and must allow the office worker’s arms to rest with his or her shoulders in a relaxed state. Armrests need to be adjustable to allow for height and arm length differences between employees. Stability – A good office chair must swivel freely. This is to allow the office worker to reach all parts of his or her workstation easily. Additionally, the chair must have a five-point base stable caster. Who should select the chair? After suitable chairs have been identified by the company (usually as part of an ergonomics evaluation process), the office worker who will use the chair should be asked for his or her personal preference between several possibilities whenever possible. This can help identify any outlier conditions quickly and increase worker satisfaction. How to adjust your office chair? Begin by standing in front of the chair and adjusting the height so the highest part of the chair seat, (without applying any angle yet), is just below the kneecaps. Sit on the chair with feet flat but relaxed on the floor. The clearance between the front of the seat and your calves (lower legs) should allow you to place a clenched fist (held vertically - thumb up) in the open space. This is approximately a 2-inch gap. At this point you can adjust the backrest either forward and backward, and either up or down until it conforms to the hollow of your lower back. While sitting upright, allow your arms to hang loosely by your sides. Then, bend your elbows approximately 90 degrees and adjust the height of the armrests until they just barely touch the bottoms of your elbows. If this adjustment cannot be accomplished and the armrests push up on your elbows in any way, the armrests should be removed. Finally, tilt the seat itself either forwards or backwards to your personal preference. Do not tilt the seat so far that your feet no longer rest flat on the ground.